From 2019 our Year 11 Programme has changed to better equip students in Year 11 with the 21st Century skills they need for success in Years 12 and 13 and beyond. The proposed structure introduces a course that better prepares students for Level 2 or the International Baccalaureate Programme (IBDP). It includes an increase in the range of subjects available and builds on the options for learning in an online and blended learning environment. We will continue to develop the offering as new facilities are built. The change in structure during Year 11 allows for greater emphasis on developing the transferable skills needed to thrive in the future and courses that provide opportunities for students to develop these skills. Introducing a collaborative project builds on work students do in the Year 6 PYP Exhibition and the Year 10 MYP Community Project. It encourages students to choose a topic they are passionate about. Project-based learning is useful for teaching skills such as collaboration and critical thinking, and provides opportunities for community engagement or outreach. Students have access to approximately 40 credits at NCEA Level 1 in 2019. This is in line with the recent government announcement. Our focus will be on the quality of credits. In the past, students have been able to achieve more than 120 credits which places the emphasis on assessment rather than learning. The new curriculum focuses on the required numeracy and literacy credits and teaching what is needed for internal and external assessments or exams. Students do not need to achieve NCEA Level 1 to study towards NCEA Level 2 or the IBDP. When they gain NCEA Level 2 they are also awarded NCEA Level 1. Parents will be informed about measurement and assessment of student progress and key skills to ensure they have a clear view and understanding of how their child is performing. Undertakes an online questionnaire that helps assess an individual’s talents and interests. They then review these results with a qualified and experienced career coach from Swivel Careers. During Term 3 all Year 11 students undertake work experience based on their occupational interests as well as their level of extroversion. Work experience allows each student to gain insight into employment, what is involved day to day and where the career path could lead them long-term. 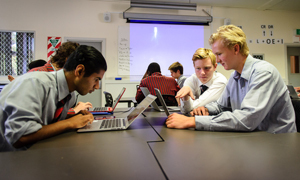 Read more on the Future Pathways Programme across Years 7 to 13 here.